Sometimes fashion weeks are all about star-studded parties and untouchable designs. In Boston, the emphasis is instead on the community and local designers. Boston Fashion Week reaches out to the community for designers and asks everyone if they want to get involved, Calerin said. “We don’t treat it like a production company or a business, we treat it like a civic initiative,” he added. Five designers and one stylist joined Calderin at the press conference. All six were among the 18 industry professionals featured at “Meet the 17+,” an official opening night event that presented 18 fashionable individuals in Boston. “We’ve had schools do shows, we’ve had really well established designers do shows, so it’s been a real mix from the beginning,” Calderin said. Cecile Thieulin, founder of Boston-based brand Simone Simon, crafts clothes that are focused on comfort and graphic textiles, pulling from her roots as an architect, she said. Anthony Gregorio, founder of the accessory brand Angelo Igitego, said that he wants to bring jobs to East Africa and Rwanda while promoting traditional African prints in menswear. Charles Neumann, of the custom apparel atelier The House of Charles Neumann, originated as a costume designer. He spoke about how it was difficult to be seen as a fashion designer, noting that Boston Fashion Week was a great way to show another side of his work. Two designers at the conference are just breaking onto the fashion scene, including Afshan Iragorri, a recent graduate of Massachusetts College of Art and Design. “Right now I’m just sort of building my name in Boston, getting connected and networking in the city,” Iragorri said during the conference. Another young designer, 15-year-old Ruby McAloon, presented her work at Boston Fashion Week for the second time. In 2016, she became the youngest designer to ever show a collection at the event. 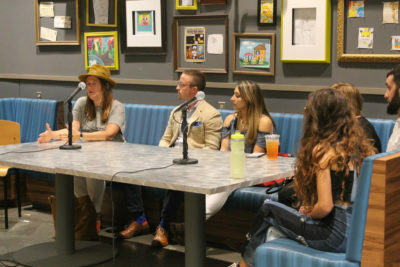 Liz Min, social media manager for the Boston University Fashion and Retail Association, said it was great that young designers are involved in Boston Fashion Week. “Since the fashion industry is changing so much, it’s important that young new designers are featured to bring in a different perspective to inspire a future generation,” Min said. Also in attendance at the press conference was stylist Terri Mahn. Mahn is the founder of an event that coincides with Boston Fashion Week called Platform Downtown at Downtown Crossing. When asked about what advice he had for people trying to get into fashion, Calderin emphasized the changing world of fashion and how important it is to keep up. All the panelists agreed that being able to actually communicate with the public is what makes Boston Fashion Week such an amazing event, for both designers and for the customers. One of the most open events of the week will be a free outdoor fashion show, which is open to anyone who wants to show their designs.